The Rebelión Collective was founded in 2003 on the initiative of a group of young high school students from the community of Santa Marta. We have worked for the past seven years in different spaces to promote political education and awareness in our town, opening spaces for the population to freely express and make public their complaints. With these ideals, Rebelión has maintained an opinion program on Radio Victoria since 2003, which airs on Thursdays from 8:30 to 9:30 in the morning, where members of the population can express themselves, complain and give opinions about the different issues addressed each Thursday. The collective decided to start publishing a monthly magazine due to the lack of democratization of the national communications media and the fact that youth participation in the countries political life continues to be rare. The idea was to permit the youth to express ourselves and to open spaces for the community to divulge their demands and complaints. 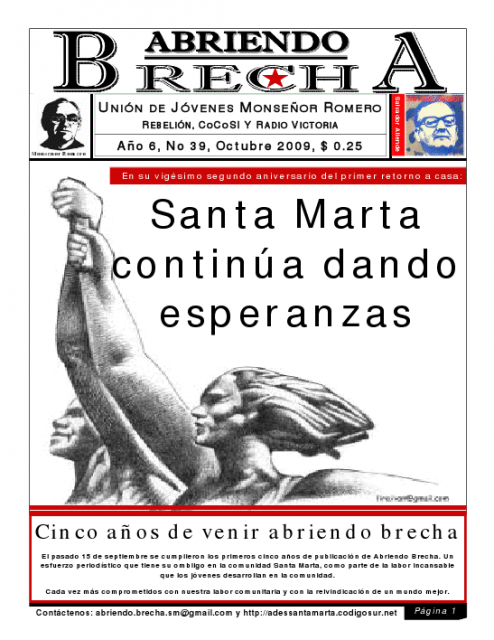 That was how the first publication of Abriendo Brecha saw the light on the 15th of September 2004. Since than, Abriendo Brecha, has continually grown more in synch with the community and fundamentally with the people of Cabañas. Facing the monopolization of the communications media in our country, we work to make freedom of expression a right that we all can enjoy, providing ourselves with the spaces to make ourselves heard. Today the Rebelión collective is working on re-launching the magazine Abriendo Brecha with its own web site. The final goal is that more people in our great community, known as earth, will be able to access our publication in real time.